Luckily, Speedy Floor Removal is here for your hurricane cleanup. If you live around near the coast in Florida and frequent the beach, there is no doubt you probably struggle with sand in your home. While the beaches give many Jacksonville and St. Augustine residents a place to cool off and relax, it, unfortunately, follows you home (and not in a good way!). Whether you own a beach home or your permanent residence is near the coast, there are several ways you can make your beach clean-up experience easier—it starts with your flooring. There are different types of flooring that are better than others when it comes to cleaning up fine particles such as sand. Below, the experts at Speedy Floor Removal have compiled the three best types of flooring for any Florida beach home. Luxury vinyl has come a long way in the past several years. What used to be very expensive is now affordable for most and best of all, easy to clean. Because hardwood flooring can be easily ruined with sand, luxury vinyl gives homes that hardwood flooring look without risking expensive damage over time. Vinyl plank is also waterproof which helps it last longer and stay durable. Many contractors have the talent to remove flooring; however, they are missing the key ingredient—industry leading floor removal equipment. This is why Speedy Floor Removal offers an assistance program where contractors and homeowners can rent floor removal equipment. Learn more about our Assist program below. If you’re thinking about replacing the flooring in your home, you probably already know that you have a pretty large project at hand. 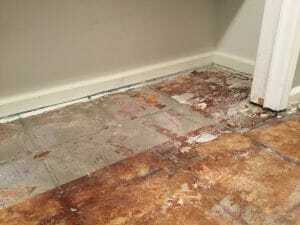 Luckily, there are many floor removal contractors nationwide to help with such a project. But with so many contractors in today’s market, there also comes a lot of impostors. So, how do you choose the best floor removal company for your upcoming project? The time has come. You have finally reached the realization that you need a new floor. Whether you are renovating your home or just replacing the tile your bathroom—the time has come to replace your floor. For the most part, floor removal is pretty cut and dry. However, what you may not realize is that there are significant differences between DIY floor removal and hiring a floor removal specialist. What is even more important to know is the effects that virtually dust-free floor removal has on you, your home, and your environment. Recently, we have discussed various flooring options, how to clean them, and how to remove them. All of these blogs had something in common—thinset. But, what is it, why is it used, and why does it need to be removed? Whether you are adding onto your home, or renovating—replacing your home’s floor is very common. The first step to this process is removing your current floor. Regardless of how you remove your floor, one thing is certain—thinset is underneath. Thinset is a blend of materials that include: cement, fine sand, and a compound that allows cement to hydrate properly. Thinset acts as an adhesive for various types of floors. 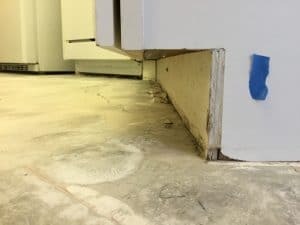 The idea is to add a thin layer-3/16 thick-of thinset to a bare, clean cement or concrete floor before installing tile, stone, marble and more. Most thiset adhesives are available in either gray or white. You’ll want to choose a white thinset if you are going to use a light colored grout, and a gray thinset if you plan on using a dark colored grout. Keep in mind that you may pay more for a white thinset because of the color modification during the manufacturing process. Direct sunlight and hardwood floors can potentially face an ugly problem; fading. If you have ever moved a rug or piece of furniture after an extended period of time, you may have noticed the area that was being covered up is a different shade than the wood surrounding it. The loss of color in your hardwood floors is a result of the big three: UV rays, heat, and moisture. Unfortunately, the problem doesn’t have a single solution. There are also some questions that arise. Why is it that your hardwood floor is two different colors? Better yet, what can be done to preserve the color of the beautiful natural wood? We have compiled the top five ways to protect your hardwood floors from the harmful UV rays. What Causes Hardwood Floor Fading? When hardwood floors are exposed to the sun over a period of time, they tend to fade, bleach, or darken—depending on the type of wood. What many people don’t realize is that hardwood floors are sensitive to sunlight. However, the type of wood is not the only factor in the discoloration of your floor; the finish on the floor also plays a factor in how the wood reacts to sunlight. Are you tired of always cleaning your carpet? Are you considering trading in your carpet for something else? If you are ready to remove your old floor and, can’t decide between hardwood flooring and tile, this article is for you! Flooring is the visual foundation of your home interiors. Choosing the correct type of flooring in your home contributes to the lighting, comfort levels, and tone of each room of your home. However, when many people decide they are sick of carpet, the next big question is what’s next? Speedy Floor Removal is here to help you remove your old floor, prep it for your new floor, and since floor is in our name, give you advice on two popular floor choices—hardwood and tile. Hardwood flooring can not only add to the aesthetic appeal of your home, but can also add to the monetary value as well. According to the National Wood Flooring Association homes with wood floors sold faster and at higher prices than home without wood floors. Hardwood flooring is a feature that is universally attractive, and tends to always stay in style. However, homeowners need to be aware of the pros and cons of hardwood flooring during the decision-making process. 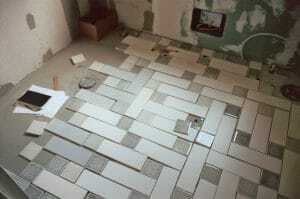 Floor surface preparation is the first and most important step for the installation of any flooring. Without proper floor surface preparation, many problems can arise once you install your new flooring system. If you have ever seen uneven floors, peeling floors, or bubbling floors, it could be because the floor was not prepped properly. Every surface needs to be cleaned, open, and porous for proper floor installation. Keep in mind that floor surface preparation is not just for residential homes, but also commercial and industrial floors as well. So, what is surface preparation? Read below to find out! What Is Floor Surface Preparation? Surface preparation is the demolition or breaking down of existing flooring and bonding between the concrete and the flooring. Whether it is residential, commercial, or industrial—the floors must be properly prepped for replacement or new floors to be installed. Following the demolition and removal of old flooring, the concrete slab must be prepped—with specific equipment—for installation. This process can be done a few different ways, but it is always with highly specialized machines that remove any elements left behind from old flooring system.